NEW YORK (WABC) -- It's going to be different this year, that seems certain. A Saturday remembrance and reading of the names at Ground Zero. Different - because the normal hustle and bustle of daily work life will be stilled by the weekend. The spirit of pausing and remembering and walking by the hole that still exists (and that's an entirely different story) at the site where the World Trade Center once stood -- will likely not happen. The truth is that fewer people than normal will actually be at the memorial service this year. If the weather is as beautiful this year as it was on Sept. 11, 2001, then it's also hard to imagine most people will be by their TV sets, watching the slow and constant and heart-wrenching reading of the names. But for those who do - and that will include once again Liz Cho and me, as we anchor WABC TV's coverage of the anniversary - it will be hard to turn away, hard not to listen to the pained and strained voices of those who read the names, adding personal feelings and memories. It is tortuous to hear in many ways. But it's important as well - at least for me - to listen to the pain, because it helps remind us, if only for one day a year, that for the people whose loved ones and friends were killed on that horrible Tuesday nine years ago, the years do not erase the grief. The emotional wounds scar over a bit, but the pain doesn't go away. For the rest of us, those who lived through the attacks and the emotionally foggy days and weeks that followed, the memories of that day are stirred at various times. Certainly the painful controversy over the Islamic cultural center and mosque a couple of blocks from Ground Zero has sparked deep emotions about that fateful day. It's a sad state of affairs that such a controversy must exist at all over the placement of the center. Some view it as an insult and affront; others see it as an opportunity at peaceful co-existence, and a chance to show the world that this country can rise above the attacks. Both sides are passionate, and I know few people who don't have a strong opinion about it. So that's a huge backdrop to this year's commemoration. We also reflect on each anniversary about what we were doing when we heard about the attacks. 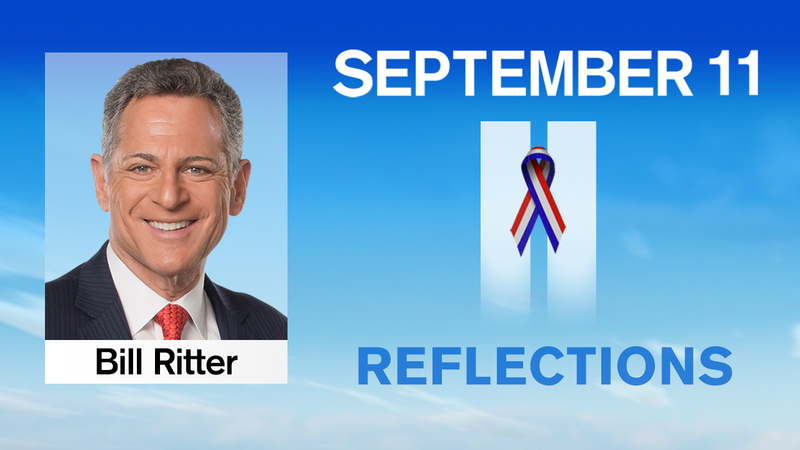 For many people, Sept. 11 has become one of those dates, like Pearl Harbor or the day JFK was assassinated. And so, I, like many others, inevitably end up thinking about how that day started, and then reliving the horrible and grotesque details of what unfolded. I have told this story before in these annual remembrances, so for those who have heard the story before, forgive and/or indulge me. I was getting ready to go to the gym on that Tuesday morning back in 2001. It was a bright, crystal clear blue-sky; the first week of school for my kids, so spirits were high. Our 6 p.m. producer, Zahir Sachedina, called me at home. "You watching what's going on?" "No, what's up?" I asked. Looks like a plane crashed into the World Trade Center, he said. Maybe a small plane. We want you to get in here and anchor this special report. I hopped into the shower, and turned the TV volume up all the way so I could hear what was happening. It was clearly unclear what was going on. And then another plane hit. I remember that the man who was anchoring at the time - a man who no longer works here - said that, for two planes to crash into the Twin Towers, something had to be wrong with the FAA's radar system. I recall throwing the bar of soap against the shower wall. Hard. And I remember yelling. Loudly. WE ARE UNDER ATTACK! I jumped out of the shower, rushed into work and was on the anchor desk as the second tower collapsed. Sandra Bookman and I stayed on air for hours. Jim Dolan was in and he was monitoring the flood of bulletins, including the one that said a United Airlines flight had disappeared from radar somewhere over rural Pennsylvania. How could it not be connected to the two planes that had crashed into the World Trade Center, and to the plane that, we found out, had crashed into the Pentagon? Didn't make sense that they weren't connected - but we had no confirmation about the Pennsylvania crash yet. That first day is a blur of images and emotions and tears held back. Not a blur that's out of focus - because I remember most of it so clearly. But a blur because it is all connected. The image of those clouds of dust as each building collapsed, so final and destructive. The image of people jumping from the buildings - leaping to certain death because the heat was just too intense to tolerate. The last phone calls, some of them to us on the air, from people who maybe knew they were going to die, maybe didn't. The thoughts of all those who had family members in the buildings, watching them burn and fall as the TVs showed the horror of it all. It is difficult not to cry, just thinking about it. The emotions, nine years later, are, I know, right on the surface. It doesn't take much to bring them up; writing these words is enough to do that. It just all felt so wrong, so terribly misguided and horrific. Whatever gripes and complaints the group that did this had against the U.S., whatever valid criticisms they could level against this country - nothing, NOTHING could ever justify the human carnage they caused, and the grief that followed. The grief affected us as well. Don DiFranco, a member of the Eyewitness News team, was on the top of one of the towers when it was attacked. Don was an engineer - and his first thought after the plane crashed into the building 20 floors below him, was to call us and tell us we might be off the air because of the crash. That was what he worried about. I hope only that Don didn't suffer. Two other images that haunt me that involve our staffers. The first is Nina Pineda and Lauren Glassberg, huddled and hugging behind a car, as the dust swirls around them. The other is a "stand up" by NJ Burkett. A burning tower was over his shoulder as he looked into the camera and talked about what was happening at that moment in Lower Manhattan. His cameraman suggested he do it again - another "take" as we call it. He did...and as he spoke, the ground rumbled and there, over his shoulder, the first tower crumbled. NJ looked back, and then, like everyone else around him, started to run. The anger and sorrow that followed are, for many, still part of their lives. It is easy to talk about "closure" - but I simply do not believe there is such a thing. As I said earlier, the wound can scar over, but there is no closure for a wife who no longer has her husband, or for parents whose child was killed, or for a child whose mother perished that day. We also try to avoid saying that people were "lost" that day. Keys are lost. Nice pens are lost. Report cards are lost. The people who died that day aren't lost. They were killed. And to say "lost" is, I think, to sugar coat the reality. It's harsh what happened, and we should acknowledge the harshness. They were killed. They died. They weren't lost. We know what happened to them. And so as we've done on Sept. 11 every year since the attacks, we will do it again this year. I was there for catastrophe. And I've been there for every memorial. And it's my honor and privilege to participate. For those of you who will watch our coverage of the ceremony at Ground Zero, know that we will be feeling the same emotions you are. For all of us, a moment of reflection helps honor those who woke up that day, kissed their families goodbye, went to work, and never returned.